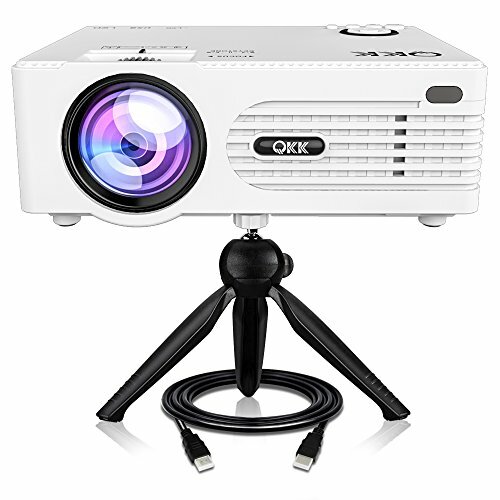  Double USB Port Designed Projector - Cocerned about many customers need to use 2 USB flash drives at the same time, QKK mini projector technical team worked hardly and successfully added another usb port on the projector (The only mini projector which has this feature on the market). By doing this, you can use two USB thumb drives at the same time.  Multimedia Home Theater Video Projector - QKK full hd projector also has HDMI, AV, VGA, SD Card port, which allows you to use it with Laptop, PCs, TV Box, Amazon Fire TV Stick, ChromeBook, Tablets, Blue-ray DVD player, SD Card, USB Flash Drive, Media players (Music, Pictures, Video), iPad, iPhone, Android Smartphones ( Wireless HDMI Dongle not included).  100% Satisfaction Guarantee - QKK team offers every customer 100% satisfaction guarantee. You can order it without any risks. If you meet any operation difficulties or quality issues, you can contact our professional technical team for help. Please rest assured that we also have 3 Year warranty. If you have any questions about this product by QKK, contact us by completing and submitting the form below. If you are looking for a specif part number, please include it with your message.